Sometimes the best outdoor family photography is captured in a candid un-posed manner and other times it is taken with careful formal poses. In these candid poses of the children the photographer captured a feeling of the innocent and fun personality of this family. Both of these photos had strong sun-drenched back lighting with a fill flash on the camera to brighten up the faces. Probably the biggest challenge for most beginnner and amateur photographers with outdoor family photography is to get the lighting right. Two of the biggest photo mistakes with outdoor portraits is taking the photos with a strong overhead light or strong back lighting without adequate fill light. 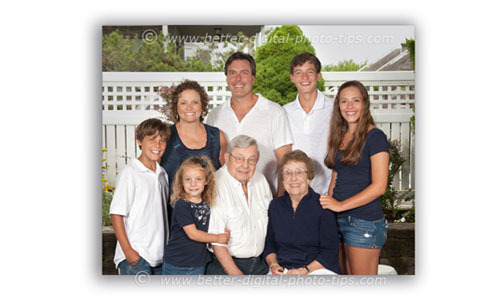 Get some new ideas for family portrait poses by exploring this web site. 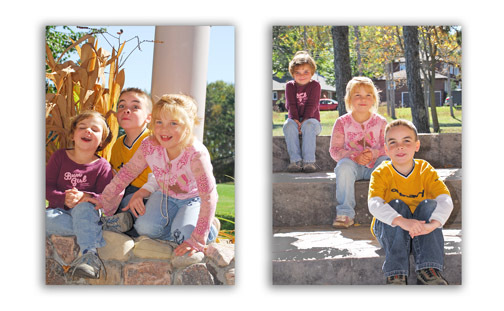 There are dozens of sample poses for a variety of family photography situations to learn from. The beach family portrait below has a completely different story-telling approach. The outdoor conditions were not so comfortable, but it tells the story of a young family enjoy the wonderment of the ocean and all that goes with it. 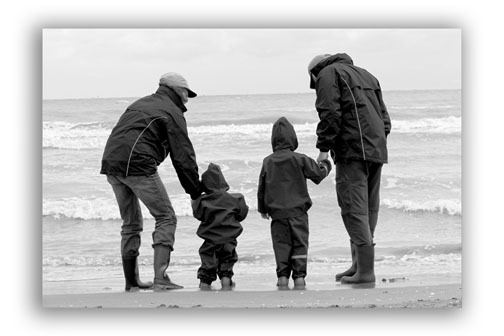 A black and white approach is not as common in outdoor family photography as it is with indoor photography, using controlled lighting and solid backgrounds. The simplicity of the ocean and the sand make it a good candidate for black and white. The overhead lighting was very flat on this overcast day but still brought out the textures and details on the clothing and the sand. The timing was perfect. The children are holding hands with the adults, who are leaning downward and inward which ties everyone together to make a nice composition. Here is a more structured, organized and posed family portrait. With everyone included, the entire family group numbered around 40 people. We had to make it an outdoor photography session to fit everyone in. This family photo had to be taken in the middle of the day because of scheduling conflicts with a few of the family members. The photograph above is one of the smaller groupings I composed that day. The family had a large, open-ended tent set up in the back yard from a party the night before. It was a great way to get my subjects protected from the mid-day sun and harsh shadows. I used my two Novatron flash heads, one on each side of my camera at about a 30 degree angle. I adjusted the Novatron power pack to balance with the existing outdoor light in the background. People use their cameras for outdoor family portraits to capture memories. One way to get better at posing families is to evaluate the family photography of other photographers, both amateur and professional. The portrait below was taken late in winter when the sun was fairly high in the sky and there were no leaves on the trees to provide any shade from the harsh sun. The pose was taken in the large shadow area from an old windmill that was just big enough to protect everyone from the harsh sunlight. 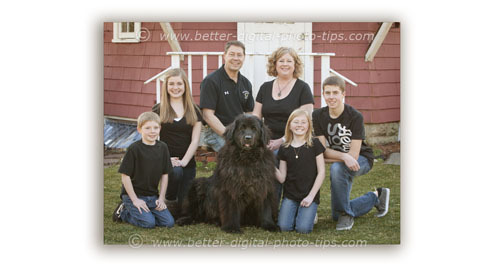 The simple clothing choice of denim jeans and black shirts is easy to find in sizes for everyone and allows us to focus on the faces of the family (and the dog) without being distracted by busy patterns or bright colors. Discovering and Implementing digital photography tips whether they are about outdoor family photography or another kind of photography will elevate your abilities to new levels you never thought possible. Outdoor Family Portraits. More outdoor samples showing good Autumn colors and good locations for portraits. Outdoor Portrait Photography. No fill flash used in this photography of a couple and of a few individuals. 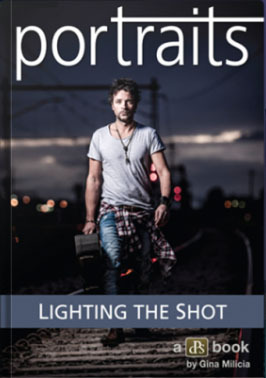 Portrait Photography Tips. Tips on posing the individual can be applied to large family poses as well. Lots of sample portraits and links to many other related articles.